My favourite way to cook zucchini is in a small saucepan with butter and thyme. 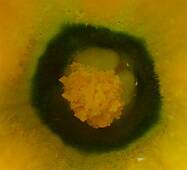 Towards the end of their fruiting life, I leave one or two zucchinis per plant to grow into a huge marrow. These are great stuffed with chilli-flavoured mince and topped with grated cheese. 13 Dec 2001: Picked 3 more zucchinis. 12 Dec 2001: Picked 2 more zucchinis today. They’re starting to pile up in the fridge – if you know any good zucchini recipes, email me! 10 Dec 2001: Picked 1 zucchini. 9 Dec 2001: Picked 4 zucchinis today. Early Nov 2001: Planted zucchini seedlings from punnets.